Nineteen-seventy-seven was no ordinary year. A peanut farmer from Georgia became president of the U.S.; Silver Jubilee celebrations were held in the UK to commemorate the 25 years of Queen Elizabeth II’s reign. New York’s World Trade Center was completed. France held its last execution by guillotine. The U.S. population reached a staggering 216 million. With the launch of the eponymous Apple II, the fortunes of the Cupertino-based company, which had incorporated earlier that year, began to take off. And in the middle of 1977, Chief Executive magazine was launched as a quarterly, with President Jimmy Carter on the cover. At its inception, the publication’s founder-owner, John Deuss, a Dutch oil trader and entrepreneur, had grandiose dreams of creating a vehicle where leaders in business, government, religion, education and society would advance their thinking on an equal footing. The archbishop of Canterbury graced the cover of issue two, and in later years Saudi Arabia’s oil minister and the sultan of Oman were featured. 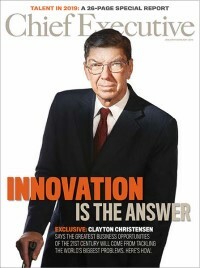 But before long, the magazine directed its editorial efforts to becoming a voice for chief executives in business, principally international business. Henry Ford II, chairman of Ford Motor Company, and David Rockefeller, chairman of Chase, held forth in its pages on the importance of international trade and the perils of regulation. In one early issue, U.S. Treasury Secretary Michael Blumenthal, IMF executive director Jahangir Amuzegar, Bank for International Settlements’ Jelle Zijstra, Nestle Director General Eric Gabus, Swiss National Bank President Fritz Leutwiler, Salomon Brothers’ Henry Kaufman and MIT economist Charles Kindleberger joined other notables to be interviewed on whether the world needed a new monetary system (most said no). With a firm focus on leaders and leadership, the magazine chronicled the activities of bellwether CEOs and witnessed how the arc of leadership thinking changed. One key indicator: the retirement in 1977 of a CEO legend: Harold Geneen. Today’s readers can be forgiven for thinking of Geneen, if they think of him at all, as a figure as obscure as Alcibiades during the Peloponnesian Wars. He was not the only major figure of the day. There was Citibank’s Walter Wriston, DuPont’s Irving Shapiro and Reginald Jones of GE. But not since Alfred Sloan ran GM in the 1940s and 1950s had a business leader captured the imagination of other CEOs, with many of them modeling their own management style after his. A former accountant, Geneen ran ITT from 1959 to 1977 with an iron hand. He turned minor acquisitions of the 1950s into major growth during the 1960s. The deals included well-known businesses like the Sheraton Hotel chain, Wonder Bread maker Continental Baking, Rayonier and Avis Rent-a-Car, as well as many smaller operations. ITT became the archetypal conglomerate, a form of business that lost its appeal decades later. For him, the numbers meant everything; the actual product that was produced seemed incidental. More than 100 managers were required to furnish him with weekly reports and more detailed filings every month. A month before he retired, 146 reports totaling 2,537 pages poured into his office. He read them all. By the 1980s, the age of the imperial CEO was coming to a close, as was Wall Street’s fascination with conglomerates. Tech startups such as HP, Microsoft, Intel, Cisco and Apple were making their mark on the wider world of business—although entrepreneurs such as Apple Computer founders Steve Jobs and Steve Wozniak were still not yet seen as being experienced enough to be models for business leaders outside of the hi-tech world. By 1981, when Jack Welch became GE’s youngest chairman and CEO, succeeding Reginald H. Jones, the world of management leadership was about to change. Within a year, Welch had dismantled much of the earlier management through aggressive simplification and consolidation. Under Welch’s leadership, GE increased market value from $12 billion in 1981 to $280 billion, making 600 acquisitions while shifting into emerging markets. In contrast to leaders like Geneen, Welch pioneered a policy of informality at the workplace, allowing all employees to have a small business experience at a large corporation. Welch worked to eradicate perceived inefficiency by trimming inventories and dismantling the bureaucracy that had almost led him to leave GE in the past. He closed factories, reduced payrolls and cut lackluster units.